THEY were armed robbers and kidnappers with taste. They looked fresh. In fact they also had two soldiers as members of their gang. The soldiers who supplied them with Army uniforms and Army pass were said to be serving in Zaria, Kaduna state until their arrest. Aside being a member of the 10-man gangsters, the soldiers equally provided adequate protection for them at check points across the country especially when escaping with their abducted victims. They rode around during the day time in one of the most expensive “machines” Hummer Jeep but hid in the thick bush in the dead of the night to rob and kidnap innocent travellers plying the busy road. Their neighbours saw them as successful businessmen because of their lifestyle and the big vehicles they were riding. Nemesis however caught up with them on the ever busy Owo-Akure expressway when acting on a tip off, detectives swooped on them as they arrived the scene to rob motorists at about 7pm. 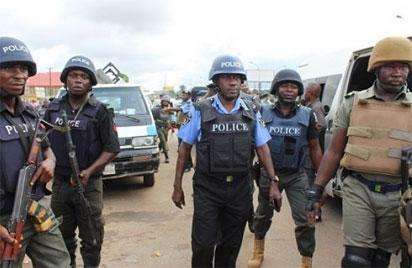 Ondo state Police commissioner, Olugbenga Adeyanju confirmed that the 10-member armed robbery gangster have been terrorizing motorists on the road in recent times. Six of them were arrested, three have gone underground while their leader lives outside the country. Those arrested include two soldiers Moruf Oguntade and Adetayo Ogunbadejo. Others are Jacob Amos, Iliyasu Suleiman, Moses Aleka and Jaiyeola Ojo. Finding showed that their leader although stayed outside the country but his own share of proceeds from all operations carried out are kept for him. Vanguard was informed by police sources that their leader monitored their operation from outside the country and got briefing regularly. One of the sources hinted that the share due to their leader was handed over to one of his trusted aides who disbursed it on instruction. Their leader was the owner of the Hummer Jeep and he reportedly used it whenever he was in the country. Items recovered from them by police detectives who swooped on them while they were about to operate along Ogudu Camp via Emure Ile in Owo council area of the state included charms, AK 47 rifle, Nigerian Army uniforms, two booklets of Army pass, one Berreta pistol, cutlasses and knives. However parading the suspects, the State Commissioner of Police, Olugbenga Adeyanju said information was received at 7.30 pm on January 7 that some armed robbers were blocking the Owo/Akure expressway in order to rob or kidnap vehicles or persons. The Police boss said his men led by Mr Sanni Lasisi the Divisional Police Officer of Emure-Ile swung into action and arrested Jacob Amos. He said the suspect confessed to the crime and led the police to the arrest of other suspects. Adeyanju pointed out that the suspect led police detectives to the hideouts of others at Shagari village in Akure metropolis where three of the gang members were arrested. The two soldiers who were not paraded according to the police chief would be handed over to the Army authorities for prosecution. However, a 37 year old suspect, lliyasu Suleiman, a technician who was apprehended alongside the five other armed robbery gangsters spoke with vanguard on what led him into robbery. He said, “I am appealing to the police to have sympathy on me because of my late mother. I don’t care what they want to do with me all I want is to witness her burial. Iliyasu confessed that that he went into robbery in order to raise enough fund for his mother’s burial. Vanguard gathered that the gang in a bid to recruit more hands sold a dummy to lliyasu that he would be rich within a short time if he joined the group. He was told that the business was Internet fraud popularly known as Yahoo. However, in his desperation to make enough money to make him live comfortably and to throw a lavish burial party for his late mother, the suspect swallowed the bait. Speaking with vanguard when he was paraded at the state police command in Akure, lliyasu who is from Kogi state said he went into robbery in order to raise enough fund for his mother’s burial. He said, “when I was introduced by one of the members, he told me that it was Yahoo. But I later discovered that the business was something completely different from what I was earlier told. “I immediately told them that I could not go out with them anymore, and they said there was no problem. It was when we went out for another operation that I knew that I was in real problem and may not get out easily. “I was told by one of the members of the gang that he would teach me how to make money faster with yahoo. When I came, I asked him, what kind of business would make me rich faster than expected but he said I should not worry. “Some days after he said we should stroll out, he gave me knife, he gave the other guy cutlass and he handled the pistol. “ We were ready for another operation and were inside the bush when the villagers shouted on us and we ran out of the bush to different direction but I was later arrested by the Police. However, parading the suspects, the State Commissioner of Police, Olugbenga Adeyanju said information was received at 7.30 pm on January 7 that some armed robbers were blocking the Owo/Akure expressway in order to rob or kidnap vehicles or persons. The Command also arrested a serial kidnapper who had been on the wanted list of the police command Sunday Omojuba popularly known as SMO. SMO was arrested by the officers at his residence in Ilutitun,Okitipupa Local government area of the state. Police Commissioner Olugbenga Adeyanju listed Godwin Ufoma , Philip Ezekiel, Ayodeji Muyijimi and Adebimpe Muyijimi as members of the kidnap gang. “He(Sunday Omojuba) was involved in a case of kidnapping in which one Olanike Agbaye was kidnapped by gunmen and her family was forced to pay a ransom of five Hundred thousand Naira(N500,000) for her release in March 2016. In the same vein, his group also unleashed mayhem on one Oluwatimilehin Olatunji on the 17th of April 2016 in which his family was made to pay a Hundred thousand Naira(N100,000) before he was released. The Police Chief added that “Likewise on the 26th May,2016 his group kidnapped one Fanegun Seun at about 20:30hrs at Mama Nigeria Street, Ayeka,Okitipupa. The family was forced to pay two hundred thousand naira(N200,000) as ransom before she was released. The post How Police in Ondo burst 10man armed robbery/ kidnap gang appeared first on Vanguard News.